Wipaq provides advanced technical Optical Turnstile to get through those issues which might otherwise become out of control. Such is the GW1000-T glass wing optical turnstile which lets the passage of the right people. This is easy to set up in any area and is a solid steel exterior and is stain resistant. The barriers can be pulled out instantly as required. * Select the Barrier Wing mode: Always open then close upon invalid read or always closed then open upon valid read for better control of access. * Integration with remote alarms, doors, etc. The GW1000 Turnstile has been designed with smooth, modern lines to blend with a variety of building architecture. This barrier optical turnstile is designed for interior applications and features 304 stainless steel construction with a #4 brushed satin finish. 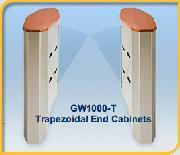 A rounded end (GW1000-R) or a trapezoid shaped end (GW1000-T) is available. The lids can be crafted from either solid surface material or wood. This turnstile is perfect for applications requiring security, control of access as well as aesthetic appeal.